Baby mobiles are essential to a nursery. Not only do they help to keep little ones entertained, they add such charm and decoration. If you are expecting, or know someone who is, a baby mobile is something that may have crossed your mind to purchase. But, what if you could make your own baby mobile? 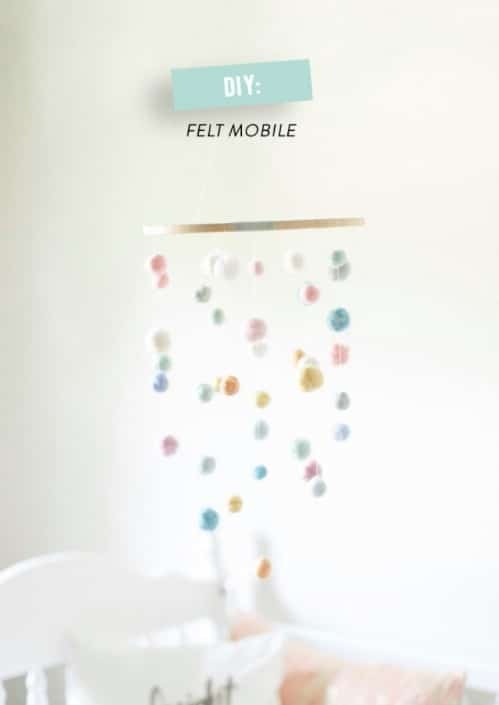 I have 25 adorable baby mobiles to share with you that you can DIY. All of these are certain to entertain babies and they make the perfect gift for a new mother to be. Whether you want something modern and contemporary or you prefer the old fashioned mobiles with colorful animals and other fun things, there is a mobile in this list that is going to be perfect for your nursery. They will add such color and charm to baby’s crib and your little one is sure to adore watching them move. Many of these can even be made with upcycled items that you probably have lying around the house. And, you should take a look at these 25 adorable baby shower gifts that you can DIY. They are guaranteed to please a new mother. Whether you are planning to make these for yourself or for someone else, they are all really easy and so adorable. 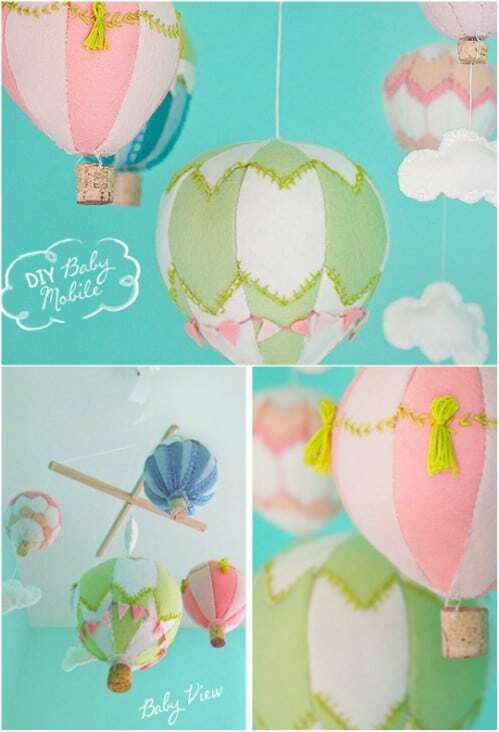 From clouds to hot air balloons and even paper boats, there is a mobile here for any baby girl or boy that is sure to bring a bit of homemade charm to the nursery. If you love DIYing your own baby items, this is definitely the project list that you want to check out. And, as your baby grows, be sure to take a look at these 20 upcycling projects for old baby clothes. This could possibly be the easiest mobile on the list to make. You just take a couple of embroidery hoops and tie up colorful ribbons that hang down to give baby something to look at. This has such a shabby chic look to it and it’s so easy that you can finish it in about an hour or less. 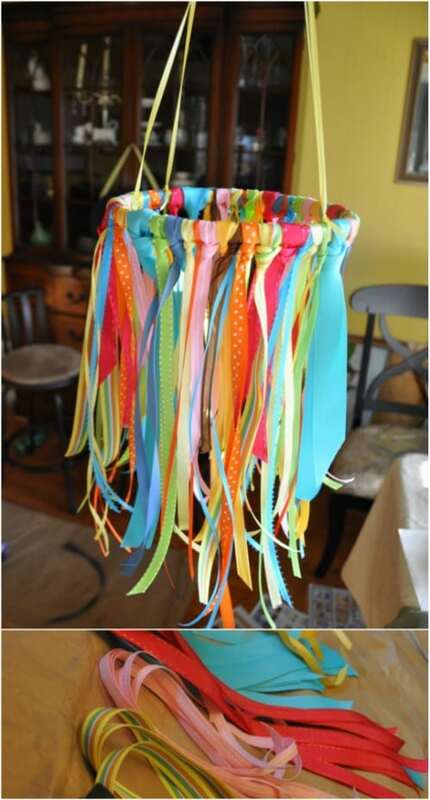 You could also add other items, like plastic toys or crochet a few animals to hang from the ribbons. 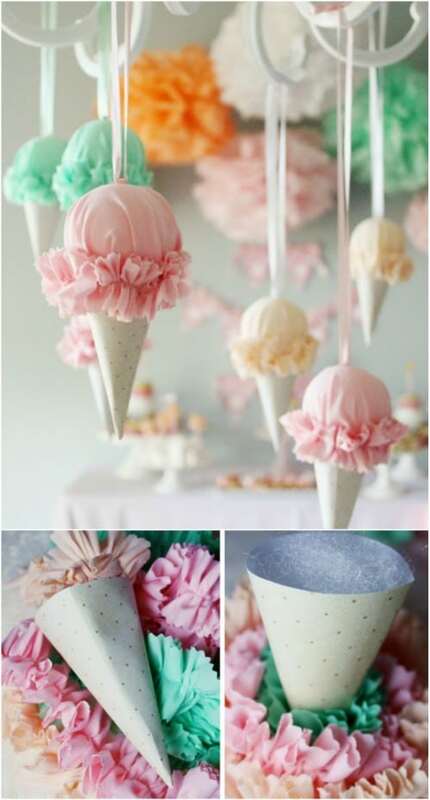 I absolutely adore this little mobile that features ice cream cones in so many wonderful colors. This one is really a lot easier to make than it looks. You create the ice cream with Styrofoam balls and then make the cones and cover the balls to create the colorful ice cream look. Even the ruffles on this one are easy to make and this really is the most adorable crib mobile I have ever seen. This would make a wonderful gift paired with some DIY baby clothes cupcakes. If you’re going for that rustic country look in the nursery, this wooden woodland creatures mobile is perfect. You make this with embroidery hoops, wire and wooden animals and it is absolutely adorable. This would be perfect for a little boy’s room and would make a wonderful gift for someone you know who is expecting a little boy soon. The colors and shapes on this mobile make it great but what’s even better is that it lights up. You add a string of clear lights to it to make it sparkle and it is really easy to make. Wooden beads in all shapes and sizes make up the mobile that you attach to a wreath form and then you just add the lights and any other special effects that you want, like baby’s name in wooden square letters. These felt hot air balloons are so colorful and make a wonderful crib mobile. Even if you have never worked with felt – or sewn anything at all – you can make this one. You can find the supplies at your local craft or hobby store, or Walmart, and they are pretty inexpensive. This one may take a bit longer than others but it is definitely worth it when you see the end result. There are so many wonderful colors in this mobile. It really looks like an elegant chandelier with its shape and this one is really easy to make. You make the discs from colored cardstock and then attach to a couple of embroidery hoops covered in yarn. It sounds much more difficult than it is and you can customize this one by choosing different sets of colored cardstock. 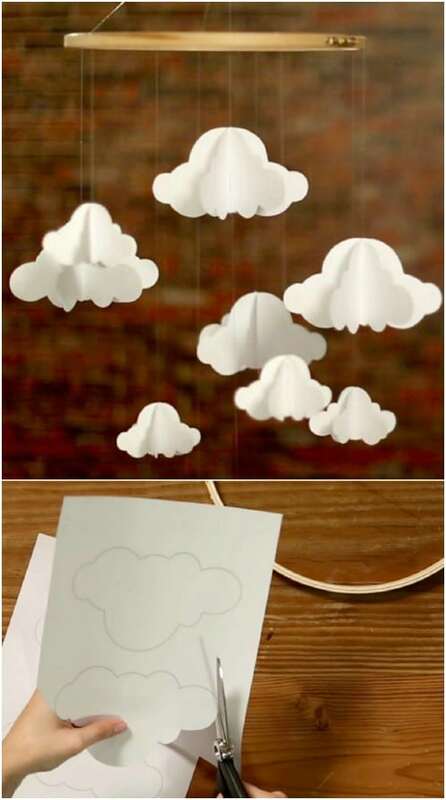 This cloud mobile is perfect for putting your little ones to sleep. What’s better than fluffy clouds? 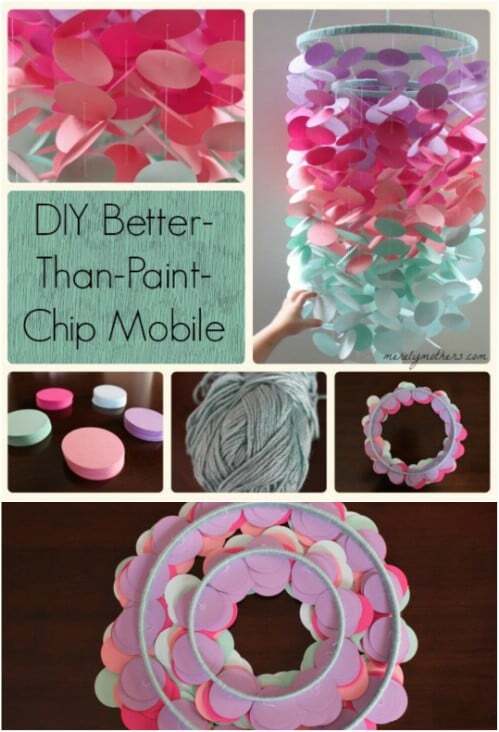 This mobile is also really easy to make and super cheap because you make the fluffy clouds out of paper. They hang with wire from an embroidery hoop and you can add as many or as few as you like – you could even add sheep and other fun items to hang down amidst the clouds. 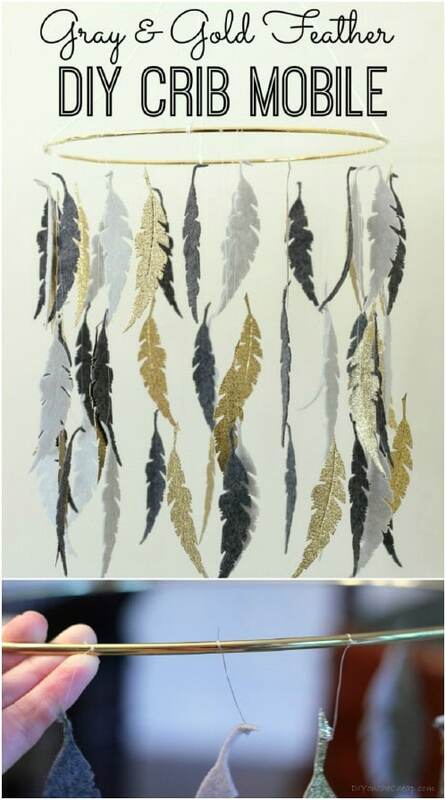 This feather crib mobile is not made with actual feathers, it’s made with felt and it is gorgeous when it’s finished. You can do this in any color of course, but the gold and gray give it such an elegant look. This is perfect for baby boys or girls and it is really easy to make – if you have a die cut machine. Otherwise, you will need to cut out your feathers by hand. Chandelier crystals, a wreath form and some fishing line are just about all you need to make this beautiful crystal crib mobile. You could also add clear lights to this one and really make those crystals stand out. This one is so simple to make and creates such an elegant crib mobile that is perfect for your little princess’ nursery. 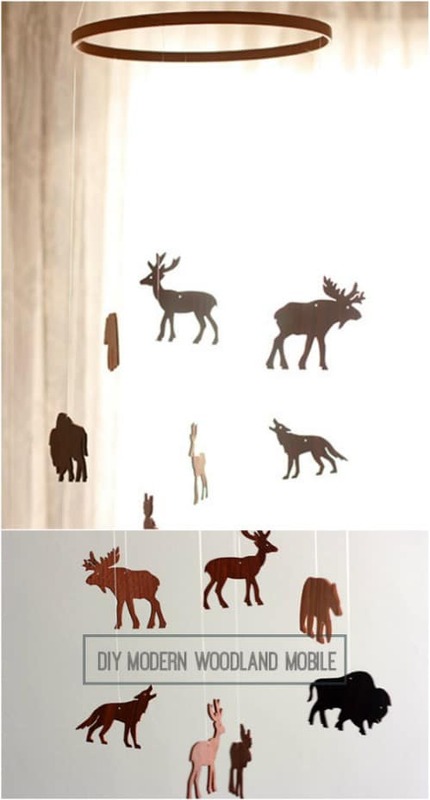 What makes this adorable crib mobile rustic is the fact that you can hang it from a twig. I love the look of sticks and twigs for creating DIY farmhouse inspired décor, and this is the perfect example. The little hearts are made from crayons and waxed paper and it is a really simple process. This is perfect for a boy’s or girl’s nursery and would make a wonderful gift for a new mother to be. 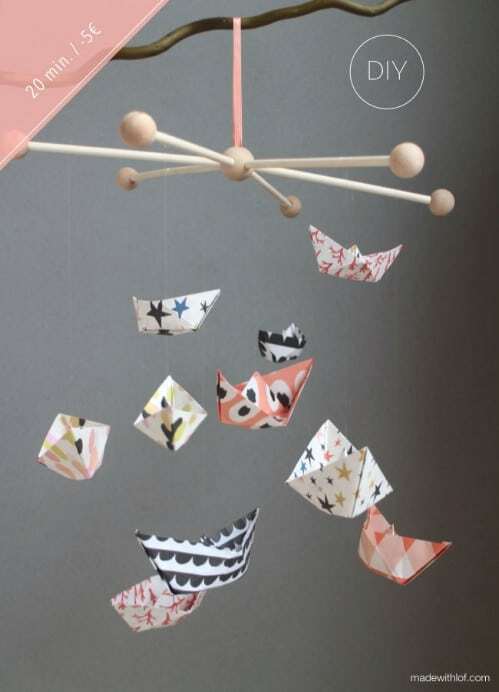 If you are having a little boy – or know someone who is – this paper boat mobile is the perfect nursery addition. This one is so unique and it has such a great vintage feel to it due to the little paper boats. You can do the boats in any number of color and design variations to match your nursery no matter what your theme. 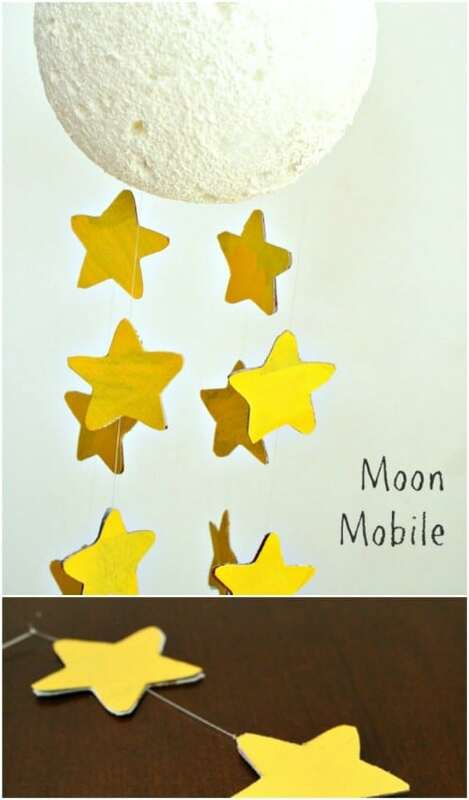 This galaxy star mobile is perfect for a little boy’s nursery and it is really easy to make. You don’t need a lot of supplies for this one, either. 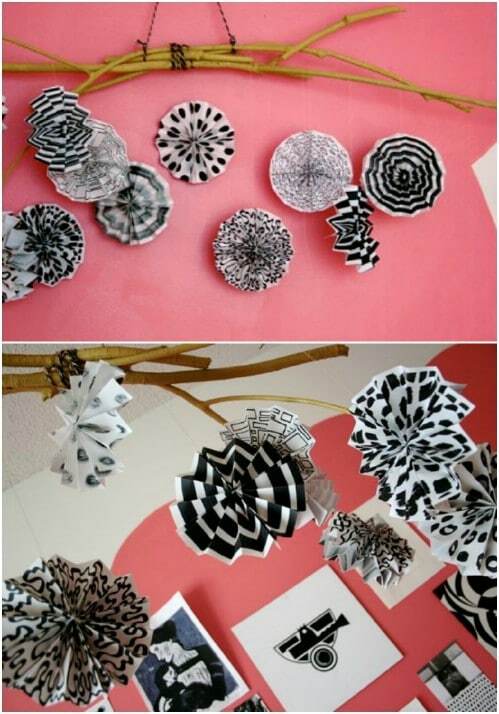 You will need cardstock and glitter paper in whatever colors you want to make the stars. You’ll also need fishing line to hang them, wooden dowels and a few basic screws and other hardware supplies. This one can be put together in no time and it makes a wonderful gift for an upcoming baby shower. 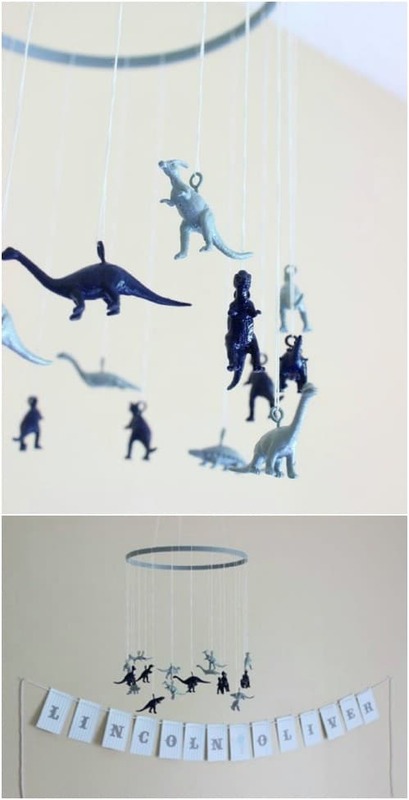 If you are having a little boy, this DIY dinosaur mobile is a must for the nursery. This one is super easy to make and you can use cheap plastic dinosaurs that you get from the Dollar Tree or Dollar Store for around a dollar per bag. You can have this one finished in about an hour or so and it makes a wonderful gift for expectant mothers that are having a baby boy – or a girl if you wanted to paint the dinosaurs a more feminine color. This rustic mobile is made from notebook paper and twigs and it is super easy to put together. You can create any color combination or design that you want with the notebook paper, then just cut out your designs for the mobile. I love how this one offers a country feel with the twigs for hangers – and if you have notebook paper, fishing line and a few twigs, this one is completely free to make. You can find so many wonderful DIY projects using twigs and sticks! A few Hama beads and a piece of driftwood can be turned into the most adorable crib mobile. I love the heart shapes on this one and the use of driftwood for a hanger makes it so inexpensive. If you have a few beads on hand to use, this one is basically free to make and it is perfect for nurseries that have that coastal design. You can turn this one out in about an hour, so it’s also one of the quickest DIY mobiles on the list. A few skeins of different colored yarn and an embroidery hoop are all you need to create this adorable crib mobile. This one is super easy and won’t take long at all to put together. This is a wonderful gift, especially since you can customize it to any color that you need to match existing nursery décor. You could also add battery operated lights to the balls and make it a lighted mobile. Not only is this mobile filled with adorable paper airplanes, it is hung from a bicycle wheel, which makes it one of the most unique crib mobiles that I have ever seen. I love the entire look of this one and it is really easy to make. 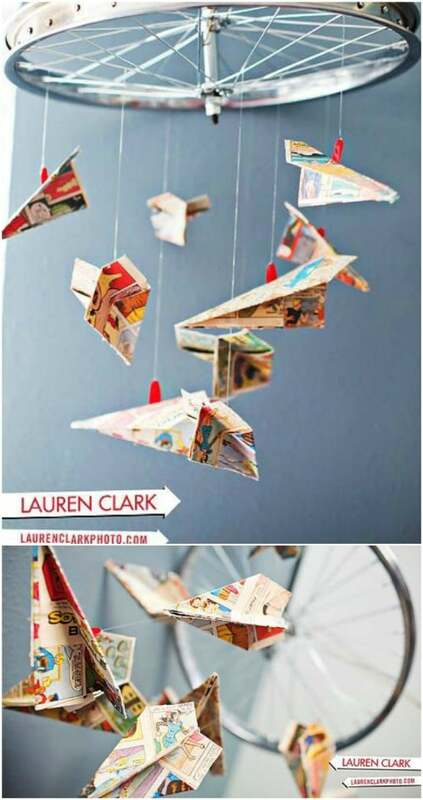 If you have older children, you can get them busy making your paper airplanes and you can make these out of any paper that you have on hand. 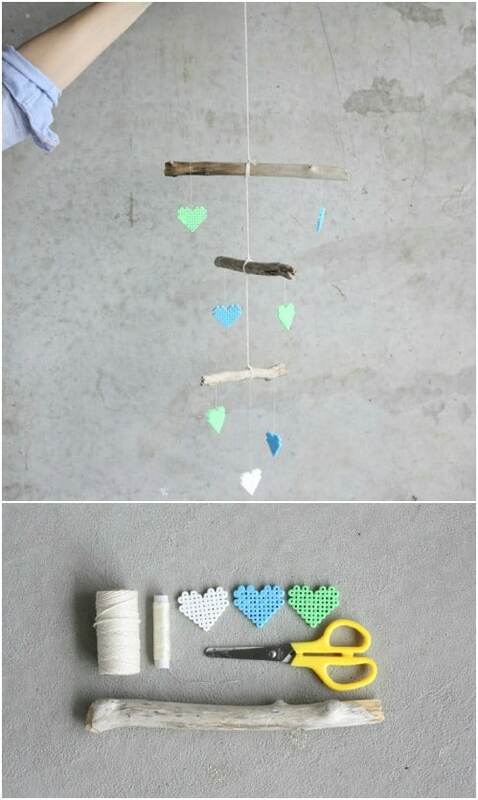 This paper lantern mobile is really adorable and super easy to make. I love this one for a coastal theme or you could do different colors to match your own nursery theme. 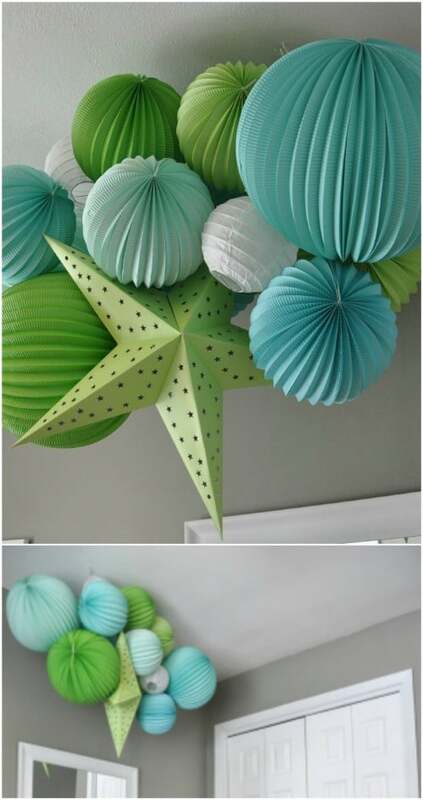 You will want to pick up a number of paper lanterns in different sizes and shapes or you can make them yourself. Once you have them all ready, just assemble into the shape that you want your mobile to have and you’re all done. 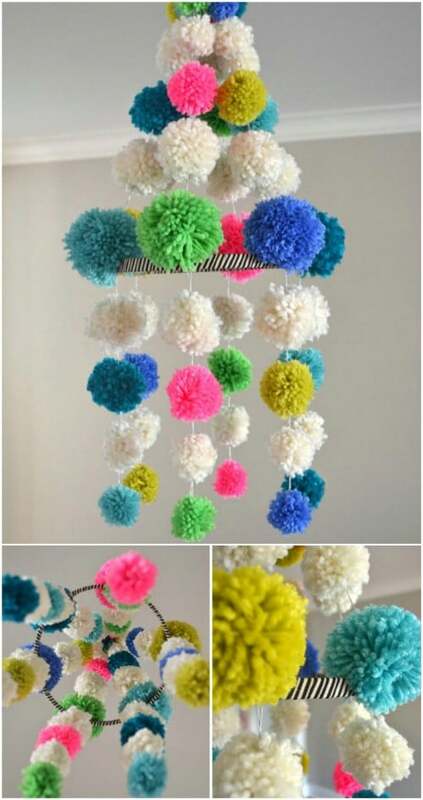 Yarn pom poms are so easy to make and they make the most adorable crib mobile. You use different colors of yarn to create pom poms in different sizes for this one. If you have never made yarn pom poms, don’t worry. They are super easy and so much fun to make. 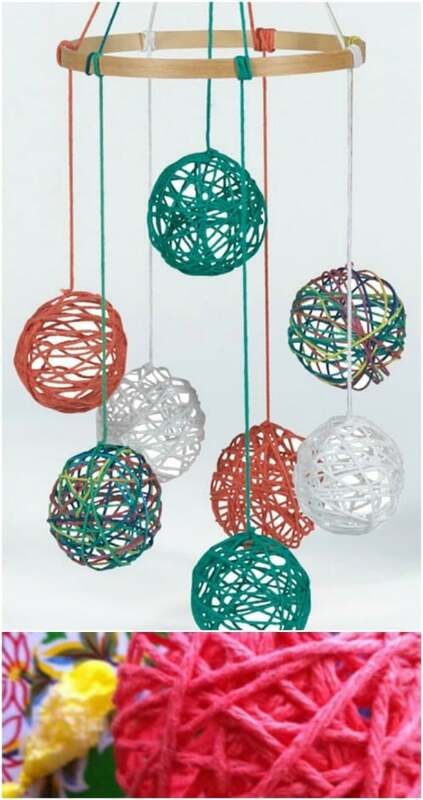 You can create your own template out of cardboard and use it to make these little yarn balls for any number of other projects after you finish this adorable mobile. If you want something a bit more modern, this metallic foam core crib mobile is perfect. You can of course, do this in any color or combination of colors that you want, but the gold metallic look really does make a statement, doesn’t it? This one is really easy and won’t take you long at all to finish and it makes a wonderful gift. You don’t have to spend a lot of money or a lot of time creating the perfect crib mobile for your nursery. You can make this one in about half an hour or less and it is sure to add charm to the room, and keep baby entertained. You just need cardstock, clear jewelry wire and an embroidery hoop for this one and the hardest part about it is choosing the shape of your mobile pieces and cutting them out. You need wool roving in a number of different colors to make this adorable little crib mobile. It is basically balls of felt that you hang onto a wreath form or embroidery hoop and it is so colorful! I love the different sizes and colors and your little one is going to love them, too. This one is really simple and won’t take long at all to make. 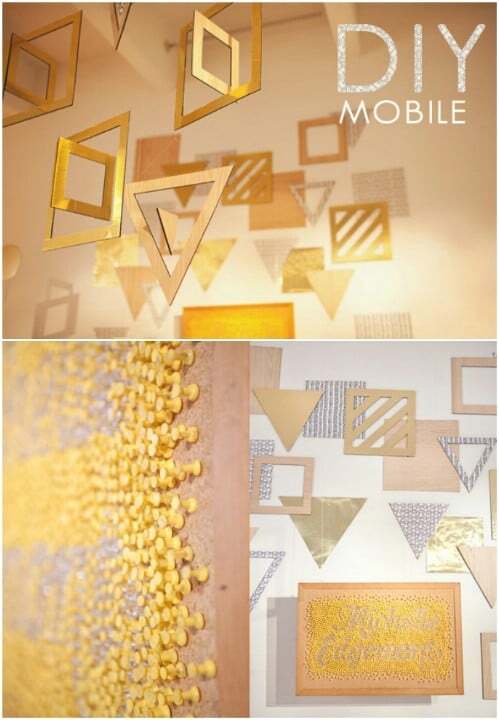 What better crib mobile for your new baby than one that showcases images of your family? 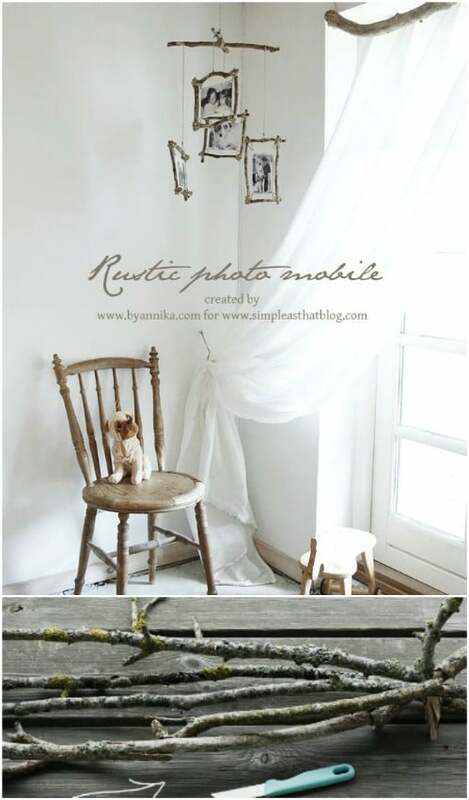 I love the idea of putting photos into the mobile and this rustic design is so each to achieve. You can use twigs and sticks for the frames and then you just have to choose the photos that you want to display. Black and white photos give it a really nice rustic look or you could use images in color or of cartoon characters – whatever you want. Handmade photo crafts really are the best. 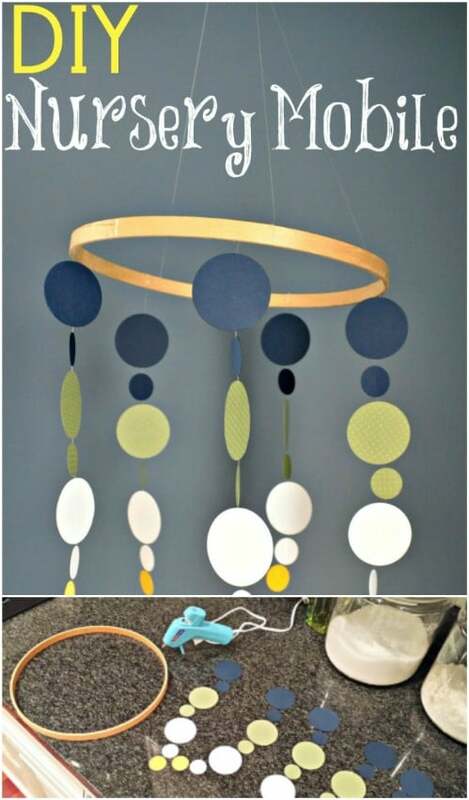 This little mobile is perfect for the nursery and it can be hung in a toddler’s room as well. I love the moon and stars look and this one is really easy to make. A Styrofoam ball and some cardstock are just about all you need for this one and it is super easy. 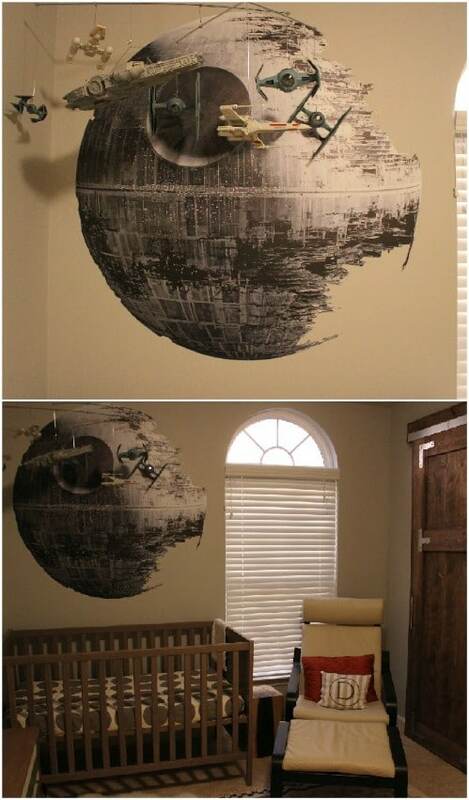 You could even let older kids help you to create it to hang in the new baby’s nursery. 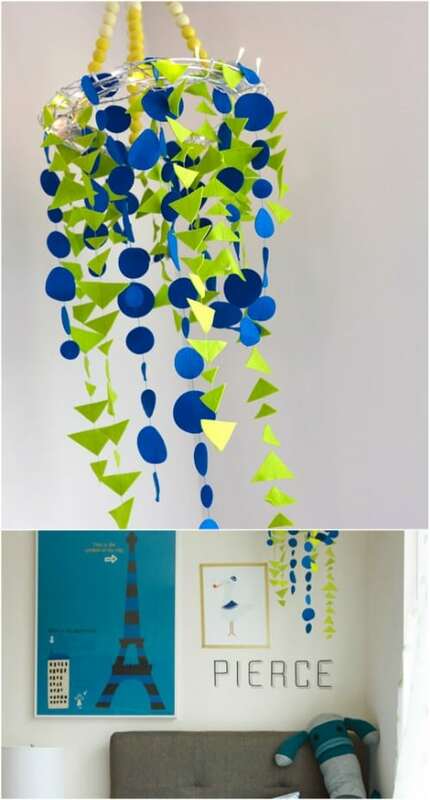 This mobile with its white wire circles is perfect for a boy’s or girl’s nursery and it is really easy to make. I love these wire balls. They are so decorative and so easy to put together. Once you have a few in different sizes, you just assemble them into the most adorable crib mobile. You could also do this one in different colors and even add some clear battery operated LED lights for an even better effect. i love these adoribale baby ideas!!!!! !